Qiang Xu, post-doctoral scholar, Shihan Qin, a electrical engineering Ph.D. student, and Ethan Wang, associate professor of electrical engineering. 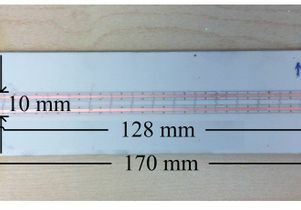 A team of researchers from the UCLA Henry Samueli School of Engineering and Applied Science has developed a device that would allow the simultaneous use of the same frequency for incoming and outgoing information on one communications device, reducing demand on the radio spectrum without compromising quality or speed of communications. Current wireless communications devices require an incoming signal to have a different frequency from the outgoing one to avoid interference and maintain clarity. In addition to allowing the same signal frequency for incoming and outgoing transmissions, the UCLA team’s new high-performance device called a “distributedly modulated capacitor,” or DMC, also works across a broad band of the spectrum. 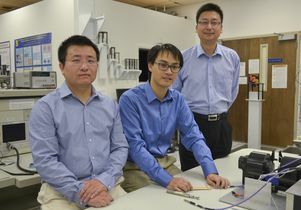 Developed in Wang’s lab, the technology can be used for voice and data communications on smartphones and other wireless devices. It could also lead to the adoption of cognitive radio technologies — a hot topic of study for the wireless industry — which are devices that detect available parts of the spectrum and use them accordingly. While components based on magnetic materials have been used to accomplish simultaneous same-frequency communications, they are too bulky for consumer technologies and allow for only a very narrow band of the spectrum to be used. Other techniques, such as those based on optical technologies, experience a loss of information and cannot be integrated onto a chip. The DMC, which is composed of standard non-magnetic materials, such as silicon or compound semiconductor, is a novel “circulator” that acts like a traffic roundabout for electronic signals. The device shifts the incoming transmission onto another frequency for processing, while leaving the frequency of the outgoing transmission unchanged. For incoming transmissions on the same frequency, the incoming wave is altered into another frequency by small physical movements made by the DMC. The outgoing waves stay the same. The research, including the theoretical principles that underpin the technology and the demonstration of a working prototype, was recently published in the peer-reviewed journal IEEE Transactions on Microwave Theory and Techniques. Shihan Qin, a UCLA electrical engineering Ph.D. student, is the lead author on the paper. Qiang Xu, a UCLA post-doctoral scholar in electrical engineering, also contributed to the research. Both are members of Wang’s laboratory. The researchers have filed for a patent on the device.